I received an email from Bill Curtis this morning regarding his acquisition of the C. W. Stuarts, and his observation about the similarity of the embossing area coverage on the Stuarts and the embossing pattern on the SHM. In the email, Bill sent a couple of rubbings along with the possibilty of the Stuarts bottle being a reworked SHM mold. An interesting consideration to say the least. Hello Bruce I got a Stuart`s last week after looking at it I dont beleive it is made from the Cassin`s mold you can see the slugged out area on the Stuart`s fits the SHM but not the Cassin`s also the Cassin`s has a different bottom and the shoulders are different and if the Stuarts was made from the SHM that would explain the circle on the front of the Stuart`s let me know what you think maybe you can put this on your site. First off, congratulations to Bill for having the good fortune to have the opportunity to acquire the bottle and have the funds to do it with (both at the same time). Seems like, at least for me, I have money when there's nothing available or visa versa... The Stuarts is a key piece and Bill should be mighty pleased to add it to his collection! Rather than offering up an opinion in response to Bills email; I'm going to respond with a number of facts and questions. Maybe we can put our heads together and come up with a reasonable group hypothesis. As we all know, mold modifications were a common place occurrence and we've seen numerous examples where So and So became So and Co. when the second "So" dissolved the partnership. Same goes for Bottled "For" being peened over, replaced by Bottle "By", etc. etc. We also know that the glass factories maintained an inventory of blank half plate molds. These blank half plate molds were stocked for two purposes. They were stocked in order to allow the mold cutters ready access to blanks with which to fill an order for an embossed mold. They were also used as the back half (plain label side) of a two piece mold bottle. 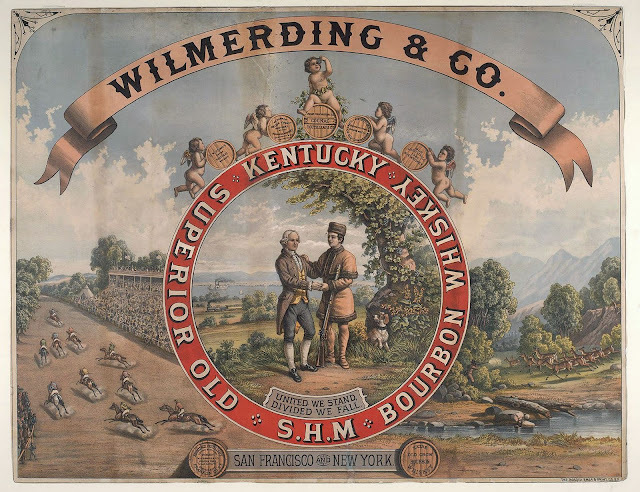 We also now know, subsequent to the discovery of the Wilmerding & Co sign that documents both east and west coast distribution, that the firm was actively merchandising C. W. Stuarts, McKenna's, United We Stand, SHM (and a few other brands) concurrently. John Thomas offered a hypothetical dating of this group as follows; Stuarts - ca. 1875 - 1883 / McKenna's - ca. 1874 - 1878 / United We Stand - 1878 - 1883 / SHM - 1874 - 1878. We discovered that the dating of the Untied We Stand was erroneous and that it was originally produced for the 1876 Centennial celebration. The length of the run, however, is still unknown but the commonality of all four bottles dates to ca. 1876 - 1878. According to Thomas, the Stuarts was blown excusively by C&I of Philadelphia. The McKenna's and the SHM were blown both by C&I and in San Francisco, the United We Stand only in S.F. since none have been documented with the C&I base mark. Cunningham and Ihmsen remained in business until 1878. The question then begs, if the Stuarts and the SHM were blown at the same time, and by both eastern and west coast glass works, what would be the logic of modifying the mold by slugging out the embossing when both molds were in concurrent use? We then look at logistics. Assuming that the SHM mold was no longer needed, and that the S.F. glass works decided to created a new half mold for the Stuarts, which makes more sense. Would they 1) Peen out all the embossing and then re-cut the old mold with a new "pattern" or 2) simply take a new fresh half plate mold out of stock and cut in the new "pattern"? Personally speaking, based on my research, John Thomas assumed a lot without having the facts to back up his statements. As I've stated previously, John did the best with the research tools that he had available and we owe him a huge debt of gratitude for giving us the foundation of research upon which we've continued to build. And in his defense, a lot of his assumptions made sense at the time based on the documentation that he had available. Personally, I believe the Stuarts back is the re-worked front to the C&I SHM. The 2 S.F. produced cylinders (SHM and McKennas) are a wider bottle too. You can really see the difference when you have them side by side. Regardless, this is a great exchange of information and my compliments to Bill Curtiss for having a good eye and interest, plus all you website holders for sharing to promote our hobby.